Riding boots: whether you’re using them for function or just because they look adorable (because let’s be real, they do), you’re going to want the best. The classic boot comes high enough up the leg to prevent the leathers of the saddle from pinching the leg of the rider, has a sturdy toe to protect the rider’s foot when on the ground and has a distinct heel to prevent the foot from sliding through the stirrup. If you’re looking for a new pair of the best riding boots, then you’ll definitely want to check out the best we’ve got in store for you! Now that you’ve had a quick look at each of the best riding boots, you’re probably curious to know more about some of them. Scroll down and you’ll find an in-depth description of each one! If you’ve looked into the best fashion riding boots out there currently, you’ve probably already come across the Sam Edelman Penny Boots. If you haven’t, let us fill you in! Sam Edelman has had more than three decades of experience in the footwear industry, and it really shows when it comes to style and craftsmanship. His products each reflect his passion for traveling and durable design to create trendy yet casual shoes. These Sam Edelman riding boots feature beautiful, burnished leather that is sure to make a statement no matter where you go. Finish them off with distressed coin buttons and an asymmetrical topline to give just the perfect amount of style and that broken-in look that’s oh-so-trendy right now. The upper is leather, and the sole is manmade, yet quite durable in both parts. One thing you really have to pay attention to with footwear, but especially boots, is the sizing. We loved the fact that these run true-to-size, which makes the whole buying process much easier, especially when online shopping! The tall knee-high shaft is not only adorable but is great on those cold winter days. Make sure to check your measurements for a good fit. The heel comes in at only an inch which is comfortable and sturdy. You’ll also find a rear zipper with a snap-tab closure to make sure your boots are securely fastened and the zipper is kept tucked in with the tab to make sure it doesn’t catch on anything or is waving around in the wind. There is also elastic goring around the top of the boot. If you have very small calves for your size/height, you may find that you’re going to be swimming in these. Make sure to pay attention to the boot opening dimension before purchasing! 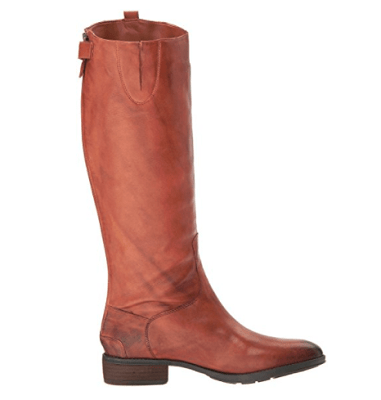 Other than that, if you’re looking for a gorgeous, rich pair of riding boots that will take you directly from the farm to the concrete jungle, the Sam Edelman riding boots are a great selection. 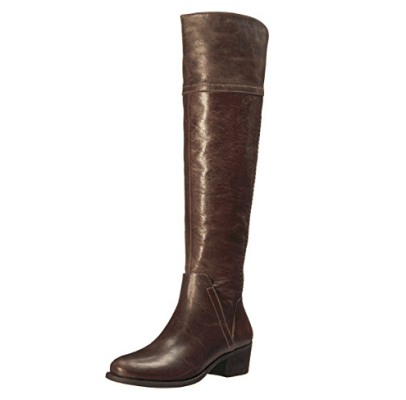 There are many attractive women’s riding boots out there, but not all of them are easy if you’re shopping on a budget. If that’s you, then the Vince Camuto Bendra Boots should be on your radar. The boots come in a variety of different colors and materials. Depending on the color, you’ll either receive a leather or a suede (refer to the photos on the link to know exactly which coordinate). The colors are Bomber Grey, Valleywood Verona, Black, and Russet. The Black, Russet, and Bomber Grey all also have the option of a wide calf, too. Make sure to read the calf opening measurements to ensure you’re purchasing the right ones for you, because the “regular” models are very narrow around the calves. Regardless of which ones you select, the fit will be pretty true-to-size, however, we did find that while wearing them with thicker socks, they’re a bit tight. 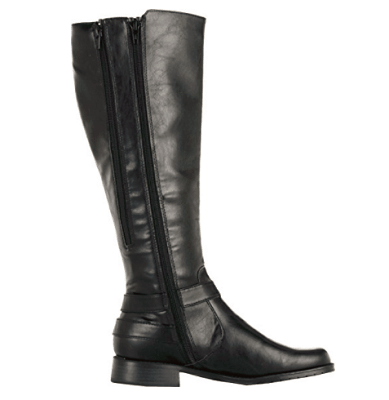 The boots are quite comfortable, with a one-inch heel that is just the right amount of height. The footbed is padded, so you do have a comfortable barrier between you and the sole. We couldn’t get over how expensive and rich the leather and suede looked on these despite the price being so affordable. They look sleek and elegant and could be worn perfectly dressed up or down. The only real complaint we had was on the subject of durability. Compared to most boots at this price point, they are pretty sturdy, but in comparison to the absolute best, they may not last through as much wear-and-tear. 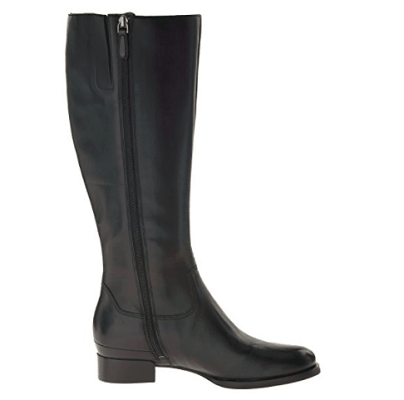 Are you wondering what the best long riding boots are and if they’re going to fit your needs? Well, if you’re looking for impeccably handcrafted, beautiful, comfortable boots, then check out the Frye Melissa Tall Riding Boots. First, let’s talk about the Frye Company. Frye is the oldest, continuously-operated shoe company in the entire United States. It was founded all the way back in 1863 by John A. Frye, who was a well-off shoemaker hailing from the UK. Their products have a long and interesting history, as they were originally worn by soldiers on both sides of the US’s Civil War, soldiers in the Spanish-American war, and even by Teddy Roosevelt and his Rough Riders. Even when people started migrating from the east to the west coast in the mid-to-late 1800’s, many of the pioneers wore Frye boots because they were the only shoes that would protect their feet from walking long distances, among other things. Today, you probably won’t have to do anything as grueling as the earlier wearers of the boots did, but they still retain their level of quality and craftsmanship. The boots are not only built impeccably; they’re also absolutely gorgeous on. 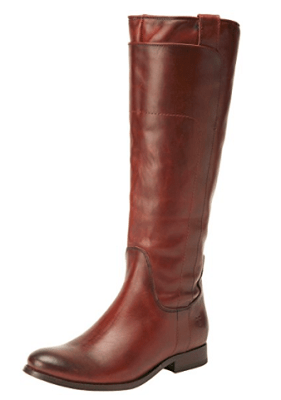 These best tall riding boots come in a variety of beautiful colors: Redwood, Black, Burnt Red, and Camel. 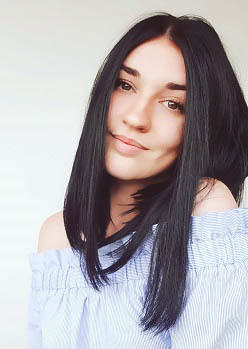 They all look gorgeous and go with just about anything, regardless if you’re looking to dress up or go for a more casual look with some jeans and a flannel. 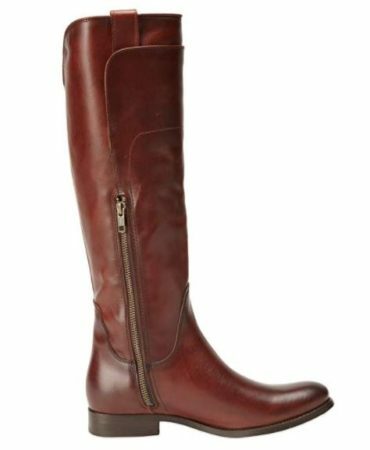 The women’s riding boots feature a kind of “layering” or doubled effect in the length of the boot which adds to the style without getting too trendy. There aren’t any stretch panels at all, and if you have bigger calves you may feel some tightness at first, but rest assured that they will stretch out for you after walking around for a couple hours or so. However, if your calf circumference is over 14 inches, we would like to recommend you a different product from this list, as they’re a bit more narrow than the others. We also recommend that if you plan on using these as horse riding boots or out in the elements, that you apply at least two layers of weatherproofing spray before your first time wearing them out. It will darken the leather slightly, but it’ll hardly be noticeable. Well, the upper is 100% leather, and the soles are a combination of both leather and rubber. They’re extremely durable and will last you through just about any weather conditions. 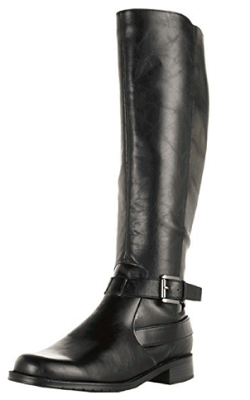 The knee-high boots also have shaft overlays, pull-on dual loops, and a notch at the back topline. To make putting them on easier, there’s also a partial instep zipper. Really, the only one is the price. It will set you back a pretty penny, however, we can truly say that these are an investment. They will last you for years of rough use, and we can say that they are worth every penny. 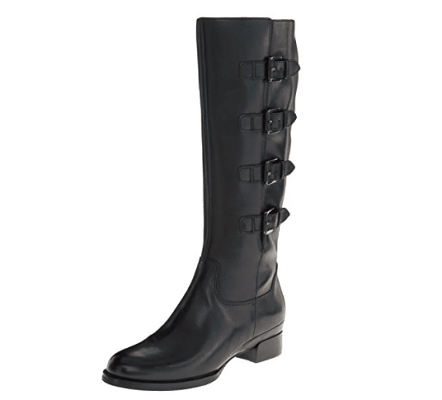 On the hunt for some trendy black riding boots but haven’t found exactly what you’re looking for? You may just find it in the ECCO Sullivan Buckle Boots. ECCO is a European shoe company founded in Denmark back in 1963. However, since then, they’ve grown quite a bit, with factories all throughout Europe and Asia. They’ve stuck around for a long time due to their affordability, great craftsmanship, and style. These are boots made for more narrow calves, and look beautiful on; not clunky at all despite the buckles that run up the side of each. The style is trendy, yet simultaneously versatile. 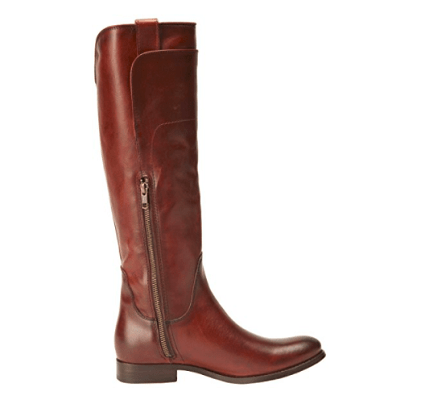 The moto trend keeps getting bigger each year, it seems, and the classic riding boot style fits perfectly in there. Made of high-quality shiny leather, it’s soft, silky, and flexible while still maintaining a good amount of structure. The non-buckle side features a full zip for super-easy access. There is a bit of stretch goring to help accommodate different calf sizes but is rather sparse. Well, the lining is a textile lining which means a good amount of breathability and airflow coming through. The footbed is lightly cushioned which makes for comfy all-day wear, no matter what activity you’re taking on. Aside from not really accommodating larger calf sizes, the sizing itself is a bit complicated, as half sizes aren’t available. We recommend rounding up if this applies to you. Need some cute new boots for work but are afraid you won’t find anything comfy enough? Not to worry! 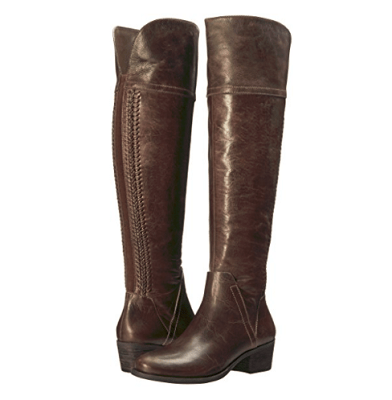 The Aerosoles Pride Riding Boot has you covered! Not only that, but they’re super affordable! The boots aren’t made of genuine leather or anything like that, but rather fabric. The sole is also synthetic. Worried about them being too loose? Now you don’t have to. The Aerosoles have Extended Calf Technology which gives you double the comfort and stability with two zippers to help it fit as it should. If you need more space, simply leave it open and you now have two extra inches of room! The boots come in a variety of colors and finishes: Black, Black Crocodile, Tan, Black Combo, Brown, and Brown Crocodile. The women’s riding boots feature diamond-patterned soles which work like little shock absorbers as you walk and stand to help give your feet and legs a break. They’ve also made sure not to include any hard boards, linings, or shanks that can be the cause of a lot of discomforts. Memory foam footbed will cradle your feet and offer luxurious comfort each step you take! Depending on the color/finish, they can look a bit “cheap” in certain lighting, but this is more of a personal preference. If you’re still having some hesitations or are a bit confused on which riding boots you should be purchasing for your needs and preferences, no worries! We’ve taken it upon ourselves to go ahead and create a buying guide so you can be sure to be completely satisfied with whichever pair you decide on! Make sure to measure your calves, if you can, before going shopping. Riding boots can be difficult when it comes to sizing. Not because of the size of the footbed, but because you also have to take the circumference of your calves into consideration. If they’re too small for the boots, they’ll be loose and look odd. If they’re too big, then they’re either going to be very tight and uncomfortable or not even fit at all. If you’re worried about this, the best thing to do is to select a pair with some kind of adjustability in the shaft. Some come with buckles, but the majority will come with zippers of some kind. Some even give you the ability to zip and make them tighter or leave them open and have some extra room! This not only comes down to looks but feel, as well as durability. The most durable product is generally going to be 100% leather for the upper, and a leather/rubber sole. You’ll probably have to apply some kind of weatherproofing spray beforehand, but it’s a small price to pay for being able to wear your boots in all the elements while being reassured they’ll stay looking their best for years to come. If you’re not too concerned about that, and just on looks alone, you can definitely get away with a cheaper pair made out of a fabric or other man-made material. When it comes to buying women’s riding boots, there is a huge difference when it comes to pricing. This is why it’s so important to consider how much you’re willing to spend on the pair, and how durable you want them to be. Usually, durability and price are directly correlated in this category, but it’s not a rule. However, if you’re spending upwards of a couple hundred dollars, you can genuinely feel safe that your boots will last you through all kinds of situations, and for years to come. So, while you’ll be paying more upfront, you may just end up saving more in the long run! Last, but certainly not least, is the comfort of your new boots. You’re most likely not just going to put them on just to sit on the couch and watch Netflix. You’re going to go to work, go to ride horses or walk around the city. With that being said, make sure you’re looking for a breathable liner, a padded footbed, flexibility, and even shock-absorbing soles if you can. It’s also nice to make sure that the top of the shaft isn’t going to be rubbing on your calves as you walk, potentially giving you a kind of “burn” or irritation on your skin from the friction. So, have you found the best riding boots for you, yet? 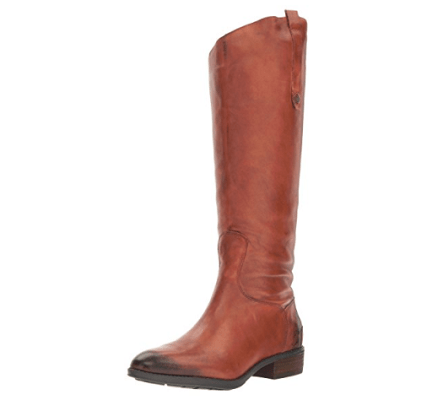 If not, we’d love to suggest our editor’s pick: the FRYE Melissa Tall Boots. First of all, they’ve proven through history that they’ve been more than just durable; they’ve been practically invincible against all kinds of elements and situations. The level of craftsmanship is not only impressive but so is the leather used to make them. They’ll not only keep you warm, but they’ll last you for many years. They’re very comfortable to wear and feature a side zipper for easy accessibility. 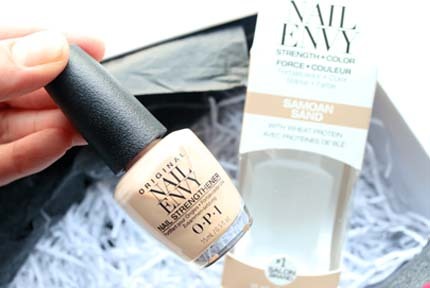 They may set you back a pretty penny, but we absolutely feel it’s worth it! So, which one of these best riding boots was your favorite?